We continue to review Wine of Moldova and we are back to the wine blend theme simply because we have a good reason to. 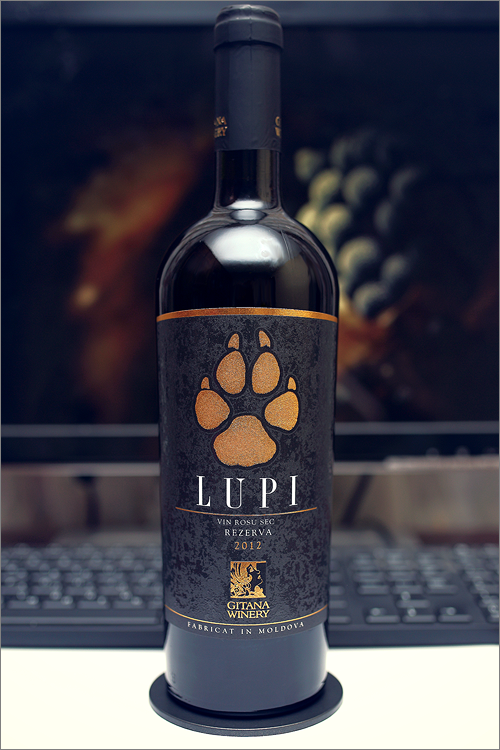 Tonight we are going to review one of the most famous wines made in Moldova – Lupi 2012 from Gitana Winery. This wine is named after a pack of wolves that settled in the area where the grapes are grown, as ‘lupi’ literally means wolves. A wine with a story behind, a story that is told with every drop and every sip – a heritage. The wine has a clear garnet color, it is deep and quite opaque, with the rim-color of a pure crimson shade. The nose is elegant and strong, with no signs of wine faults. The first nose unleashes nuanced notes of black fruits and strong hints of barrel maturation: blackberry, leather, black cherry, sweet tobacco, dried cherry, cloves, black tea, red pepper, a bit of black pepper and a hint of dark chocolate. The wine is extra dry and strong, with no signs of residual sugar. It has a strong alcohol level, high-plus acidity and seedy-dry tannin. The wine feels nuanced, elegant and noble, with a clear new-world profile. It has a fair overall balance as this is a bold, extracted and complex wine – it may feel a bit angular and seedy, but quite delicious and fruity. This is a wine with a strong character and a unique aroma profile. The wine has a medium-plus, a bit bitter-seedy finish, with a balanced aftertaste – crisp and burning hot at the same time. This is definitely a great Wine of Moldova and the overall rating says the same, with 90.0 points scored it is right there, among the best wines we’ve tasted so far. Please click on the chart icon on the left in order to get to the wine rating page, where you can find all the wines we’ve tasted to date. Last but not least, we would like to mention that this wine was already highly appreciated on the international scene with a silver medal by Concours Mondial de Bruxelles – one of the leading wine tasting competitions in the world of wine. We would also like to highlight the overall potential of a top quality wine from Moldova – powerful and bold, made in a fruit-forward, new world style, where barrel maturation dominates over variety – a wine with lots of character and charisma. We can only encourage winemakers to make more wines like the one reviewed tonight and raise the bar even higher with the upcoming vintages or, why not, wolves! Great site! I love learning about wines from places that are not they”usual suspects.” We live in Napa valley but love to explore wines of the world. Check out our Napa valley wine blog: http://www.topochinesvino.com and follow us if you like what you see. Thank, we also love exploring wines from all around the world!